Hi, dolls! 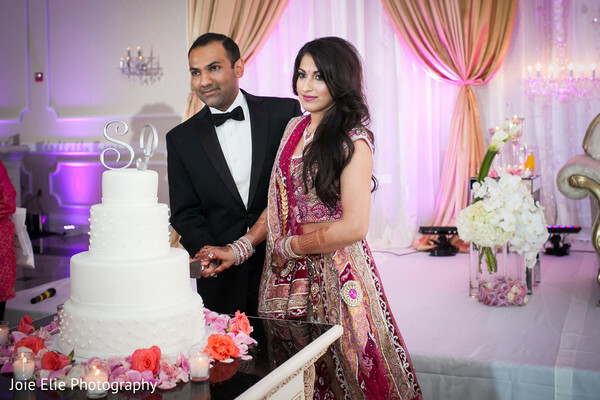 As always, I'm keeping my word and showing you the reception pics of the New Jersey Indian wedding by Joie Elie Photography & Cinematography and Ring to Aisle Events. Remember the wedding outfit? Well, feast your eyes on what she has on now! Another gorgeously breathtaking design! 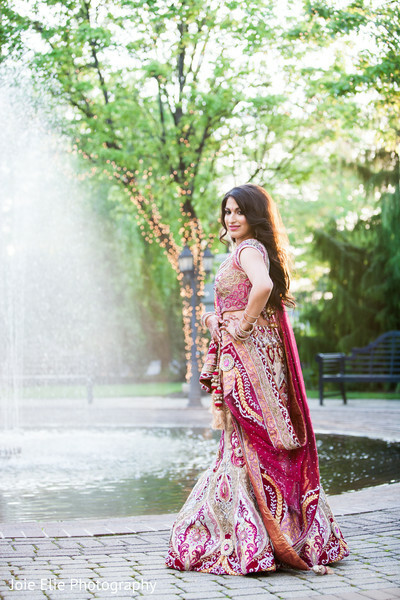 Maharani Shefali is a serious fashionista! Flawless Beauty by Pauline dolls her up for the special occasion. Every detail is perfection. The paper roses (pink and frosted gold) as well as the place cards and menus are provided by Azure Couture Event Stationery. 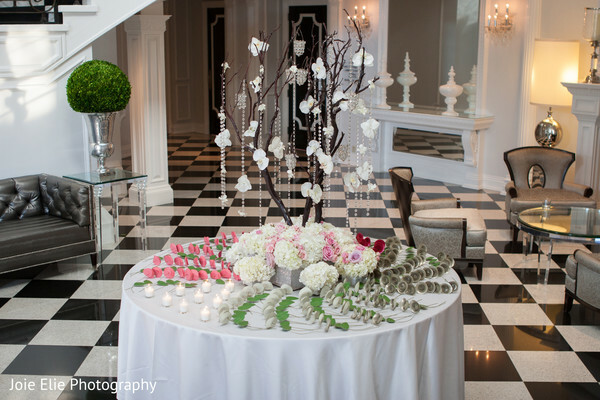 And the table-setting is so inviting and creative! Design House Decor does a fab job! What a stylish event from start to finish! The entire gallery is a must-see! "The decoration and music was everything we had hoped for. There was a wild shuffle for Parth's shoes amongst our bridesmaids and groomsmen, which made the day even more memorable. Cocktail hour lead into our reception, concluding with the Viennese Hour, which was heaven for those with a sweet tooth! Our paper roses from Atelier Azure that we had as place cards were a huge hit as well. The ballroom was so eloquently decorated, from the centerpieces to the reception stage. Our wedding weekend was everything we could have asked for and more, thanks to all our family, friends and vendors that were so cooperative!" 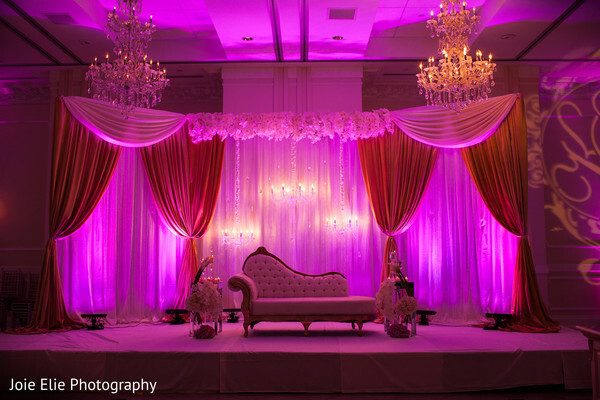 "As for reception, I wanted something romantic, soft, lavish and pink! Design House catered to all of the events with perfection. I also wanted to match the place cards to my lengha, and Atelier Azure worked with me on designing the place cards as roses - we had the roses on the bride's side as fuscia and the groom's side as gold. Our guests either put them in their hair or their suit pockets and it was a fun way of figuring out who was from which side during cocktail hour while everyone were mingling." "It took me a while to finalize on my reception outfit, but when I saw it on a model on a display in one of the stores, I knew it was the one! My father actually spotted it first! I tried it on and I knew it was the one." "Our families helped us throughout the whole planning process, we could not have put the event together without them!" "I loved Addison Park the moment I saw it. 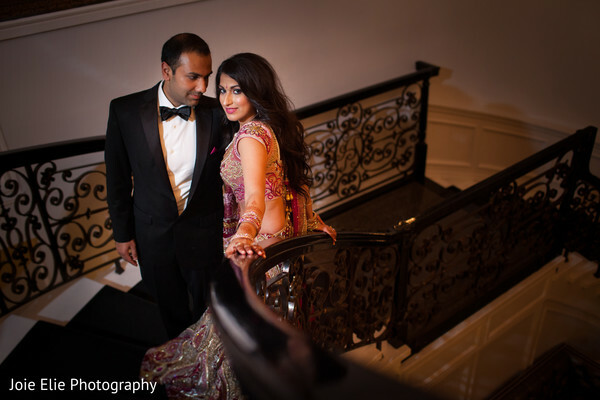 The ballroom was exactly what I was looking for and I loved the modern lobby with the black/white color scheme and double staircase." Hope you adore this gallery as much as I do, girls! 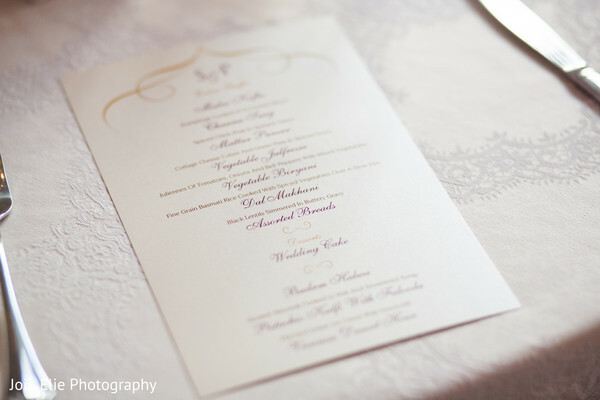 Design House Decor, Joie Elie Photography & Cinematography, Flawless Beauty by Pauline, Azure Couture Event Stationery, Medley Entertainment and Ring to Aisle Events are members of the Platinum Guide. Love what you see? Explore their portfolios.